Android users are once again in danger of getting their information collected and being hit by an unending stream of spam and unwelcome offers just because they searched for popular games on Google Play and made the mistake of downloading bogus apps. 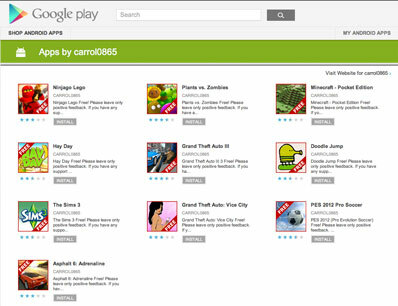 The latest scammy “developer” spotted on Google’s official Android online market named himself “abbarandon”, and offers for download “free” versions of popular apps such as Plants vs. Zombies, Pro Evolution Soccer 2012, Grand Theft Auto III, and others. Impatient users who download the games without looking at the description will be surprised to find the apps are intent on collecting information about them (email address, mobile phone number) and show a variety of ads in the app and the device’s notification tray. “But it doesn’t stop there, the app is also going to change your browser’s home page, add a bookmark, and add icons to your device’s home screen. All of this is designed to earn money for the app developer,” points out Sophos’ graham Cluley.